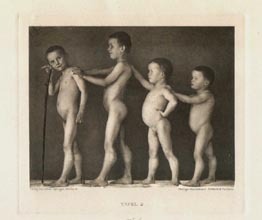 Dystrophia muscularis progressiva, infantilis, familiaris, pseudohypertrophica. Four siblings aged 12, 11, 8, 7 in years, who are depicted from different perspectives in 3 plates. Providing examples of the differing developments of this more common type of the progressive muscular dystrophic. The parents of the children are healthy and not straitened hereditarily. From the marriage descend 13 children of which the oldest died from an unknown illness, 6 are still healthy, and 6 are stricken by pseudohypertrophy. Included among the ones who are sick is a second born child, a 17 year old male,* after him follow 2 healthy girls, then 5 sick boys in unbroken sequence, and then again are 4 healthy girls thereafter. Of interest therefore is that as yet only the boys in the family are afflicted. 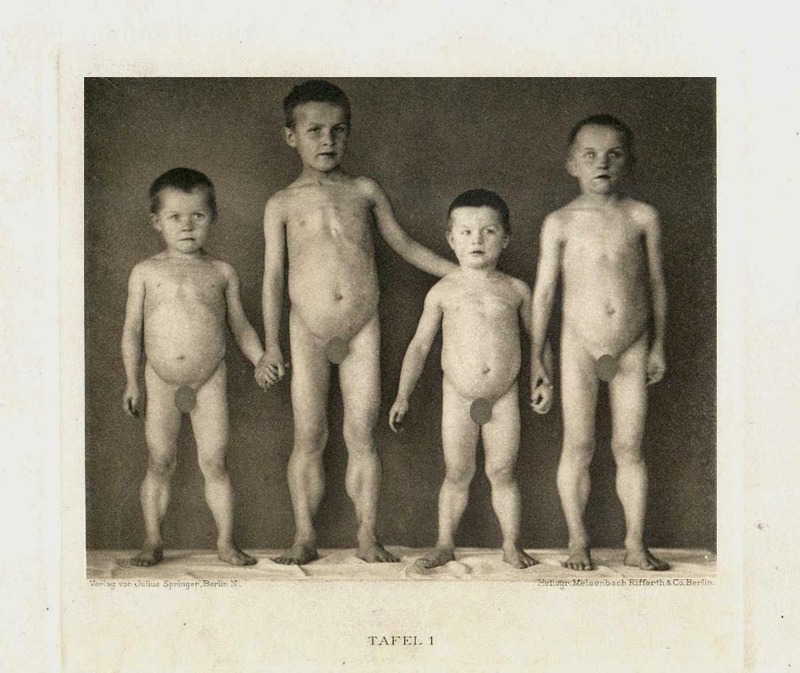 All 4 siblings demonstrate in more or less striking development that which is so typical of this disease type, particularly the pseudohypertrophy of the lower limb, primarily in the calf muscles without an appreciable reduction of their function. The upper limbs for both the younger boys are enfeebled, for the older ones normally developed and relatively strengthened. Facial and neck muscles are unaltered in each one. For the most part, the muscles of the trunk, of the scapular bands, and of the arms of the children have suffered. The oldest boy is by far the most severely stricken. He presents the characteristic image of the disease type: the considerable lordotic forward curvature of the backbone resulting from episodes of pervasive atrophy of the back exstensors, the almost total wasting of the pectoral muscles, the latissim. dorsi, teret. major., the rhomboidi and to somewhat lesser degree the musc. deltoid. The youngest boy is the least sick, with him only the musc. supraspinat., infraspinat. and latissimi dorsi are somewhat atrophic, the remaining portions are pseudohypertrophic but capable, portions unchanged. 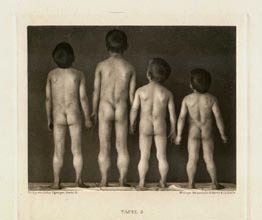 The second youngest boy is himself distinguishable through the virulent atrophic laming of the long back extensors and of the latissimus dorsi, while his twin is also remarkable for the posture of an obviously degraded condition of the back extensors and the gluteals. *Not observed in the clinic.